When you have all the solar components such as the solar panel, meter gauges, charge controller, battery bank and power inverter all connected, the next step is to do a charging test to make sure everything is working fine. First, get your multi-meter and set it on DC amperage. Clamp it on the live wire coming out from the charge controller going right to the battery. See what kind of juice you are getting. You should see a DC amperage figure on the multi-meter. Since the battery is running on 12 volts, you can calculate how much power is going into the battery by multiplying the amperage (I) with the voltage (V). 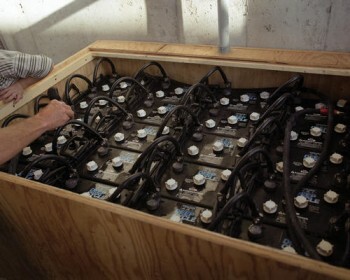 That will determine how much power in watts you can withdraw from the batteries. When you want to find out how long the battery will last, it actually depends on what kind of load is consuming the power. If you are trying to run a 150 watt flood lights on the outside of your house at night, the deep cycle batteries of your solar system will only last for a couple of hours. Therefore, when using renewable energy such as solar, it is best to go for economical lighting fixtures such as using compact florescent bulbs that draws only 800 milliamps. Such energy efficient light bulbs will run for weeks by using power from the battery. If you don’t want to use the power inverter, you can even use a 12 volt marine activated light and it will work directly with the 12 volt battery. You don’t need to use the inverter at all thus extending the battery output. Depending on what you actually want to run, you choose your lightings and your loads and that will determine how much run time you will get out of your home solar system battery bank. Do you want to know how to use solar power at home to reduce your electricity bill? If you do, check out the Earth4Energy e-book by Michael Harvey. The manual will show you to build a low cost solar panel and the procedure to setup the charge controller, battery bank, power inverter etc. Check out the Earth 4 Energy information post on this blog to find out how the e-book can benefit you. Great article, there are all kinds of articles saying we need to be using these but this is the first one I’ve seen on testing them. Or saying what kinds of bulbs to use. The Earth 4 Energy is a great source of information also. Keep up the good work.